After an out-of-this-world tour of the Harvard Museum of Natural History and the Peabody Museum of Archaeology and Ethnology, Mom and I were more than ready for a delicious lunch/dinner (linner?). Since I'm taking a week-long vacation while I transition from my state job back to my former employer, I'm dragging Mom around New England to visit all the places that we never get a chance to see. Mom found a restaurant online that was just seven minutes from the museums, but unfortunately it was closed. Not wanting to have a meltdown, I put my brain to work and tried desperately to think of a restaurant that we could stop at before the long ride home. 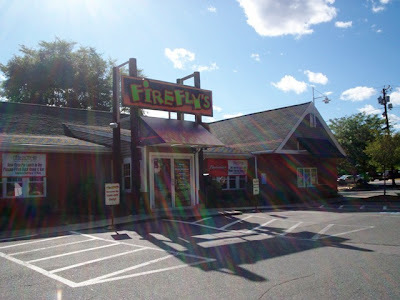 I came up with Firefly's, a restaurant that I had seen advertised many times on The Phantom Gourmet. Located in Quincy, we pulled into the parking lot at just about 3:30 p.m. Unfortunately, the restaurant didn't open until 4 p.m., so we had to wait. Famished but brave, we waited and were the second group to walk inside the restaurant (there were two hungry men waiting in the parking lot). We were immediately greeted by a friendly hostess who asked us if we had been to Firefly's before. I usually hate to say yes because they go into a whole back story, but Mom told her that we hadn't. The hostess brought us over to a shelf with a variety of hot sauces and told us that they were all available to try and/or buy. She also explained about their hottest sauce - something called Mad Dog 357. Housed in a little jail cell, you need to sign a waiver before trying this stuff. I was not feeling very brave today, so I didn't try it. However, after doing some research online, I found that this sauce is billed as "the world's hottest sauce," and it is suggested that all who try it have one drop only. Wow!! The hostess then explained the salad bar area, which also contained vats of their special sauces. She told us that we could help ourselves to the bar, and then showed us to a very comfortable banquette. The hostess left us with two large, colorful menus which playfully opened at the top rather than on the side. We were then greeted by our waitress. 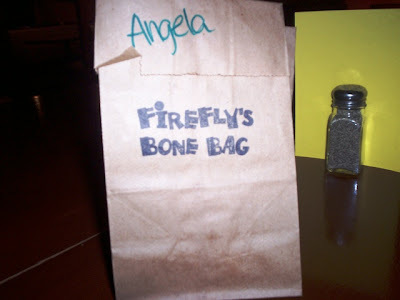 Her name was Angela, and when she arrived she brought over a bone bag, which was to be kept on the table for bones and other miscellaneous trash. She wrote her name on the bag so that we wouldn't forget it. She also asked us if we'd been to Firefly's before. Again, Mom said no so Angela proceeded to explain the menu to us. She went over each page quickly and efficiently, explaining the sauces and the different plate options. Angela then asked Mom and I what we would like to drink. We ordered two Diet Cokes which quickly arrived in very large plastic glasses. I guess they know that the customers are going to want a large drink when taking in all that hot sauce. When Angela returned to the table (Mom and I needed a minute to make up our minds), we placed our order. We ordered THE EXACT SAME THING! I don't know what came over me. What Mom was ordering sounded so delicious that I had to have it, too. We both chose the pulled pork platter ($13.99 each) topped with their award winning Memphis sauce. 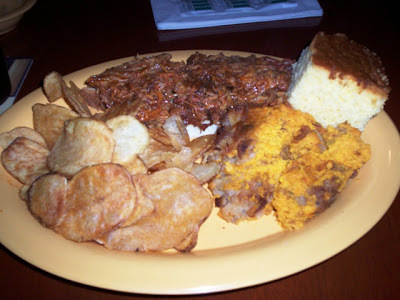 The platter came with cornbread and our choice of two sides. We both chose the homemade chips and the sweet potato pecan pudding. Angela raved about the two sides and told us that they were her two favorites. She took away the menus and left Mom and I alone with a small dish of cucumber salad that Angela had brought over when she first came to our table. Unfortunately, the cucumbers didn't last very long. I scarfed them down. Mom says that I "shoveled" them down, but hey - I was hungry! It was delicious, too. Very cool with a hint of sweetness. The dining room decor is quite adorable. With the blues playing in the background and little flames peeking out from around the corners of the room, you knew that you were in for a "bodacious bar-b-que" meal. There was a mix of booths, tables, banquettes, and a bar area that I couldn't quite see from where I was sitting. The lighting was on the dark side, so that made it a little difficult for me to get a clear picture. Since the restaurant had just opened, everything was spotless. I even paid a visit to the restroom and it was extremely clean and organized. I spotted Angela coming over with our plates after only a few minutes of waiting. There was almost no wait at all. When Mom and I had first pulled into the parking lot, we could smell the intoxicating aroma of barbecued meat. I guess they slow cook their food ahead of time so that the customers aren't kept waiting very long, which is a great idea. Since we both ordered the exact same thing, our plates looked identical and smelled delicious. We both thought that the portions were huge. The piece of cornbread was pleasantly moist which is rare with most restaurant cornbread. The pulled pork was perfect. It was very tender, lean, and extraordinarily tasty. The pork was served sitting on a "trailer park crouton," which Mom and I believed to be a piece of Texas toast. The homemade potato chips were thick, crispy, and outstanding. They were not at all greasy, and not overly salted. The Memphis sauce that topped the pork was very mildly spiced with brown sugar, molasses, and chocolate and was deliciously sweet. Finally, the sweet potato pecan pudding was to die for. It was almost like a bread pudding in texture, and you could really taste the pecans, brown sugar, and cinnamon that gave it a delightful sweetness. This side dish was so good that you'd probably want to make a meal out of it, but don't because you'll miss out on all the other goodies. Firefly's was certainly generous with the helpings. If you walk out of this restaurant hungry, then you only have yourself to blame. We had a LOT of food on our plates. There is a lot to choose from at Firefly's. 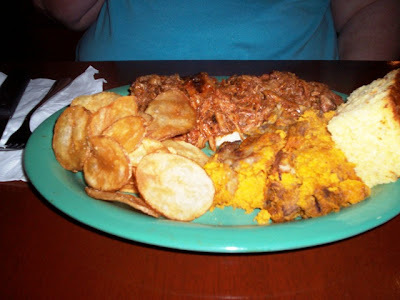 Appetizers include The Phantom Platter, which is the favorite of you-know-who ($19.99), catfish on a stick ($8.99), armadillo flats chili ($5.99), cracklin bread ($7.99), and fried green tomatoes ($7.99). Entrees, which come with corn bread and sides, include the bodacious beef ribs ($21.99), various tips ($16.99), cued-up shrimp ($16.49), A Waffle Lot O' Chicken ($14.99), and the Oink, Cackle, and Moo ($18.99), which is a 1/3 slab of St. Louis ribs, a 1/4 chicken, and slow-smoked sliced beef brisket. I bet this portion is humongous! While I'm on the subject of ribs, I should mention the two types - St. Louis and baby back. The St. Louis have minimal fat and are very meaty (weighing almost three pounds). Baby back ribs are a little fattier, but are very tender and flavorful. They are not as heavy as the St. Louis ribs (only two and a quarter pounds). Several of Firefly's signature sauces include the Dixie Kiss (sweet tomato-molasses), Beelzebar (spicier version of Memphis), and the North Carolina (vinegar and red pepper based). Platters include the chopped brisket ($14.99) and smoked sausage ($13.99), while combos range from $18.99-21.99 and include your choice of meats, sauces, and two sides. Meat options include the ribs, pulled chicken and pork, Jamaican chicken, sausage, brisket, and fried chicken. There is also a kids' menu and a dessert menu, which I was very bitter about when I got home because I saw that they offered a piece of red velvet cake ($6.49). I've been dying to try that! Firefly's also does catering, as well as a large take-out business. Mom and I usually don't spend this much for lunch, but for a barbecue restaurant, this was pretty average. Plus, considering all the food you get, this may even be a steal. We left $41 on the table for Angela, including a 20% tip. She was an excellent waitress, and not only that, the hostess was great and so was the older gentleman who came to our table to ask us how we were doing. It must be nice for them to be able to get a chance to interact with their customers while the restaurant isn't busy. 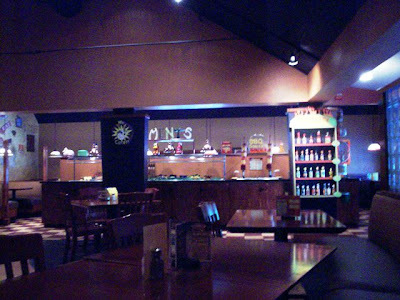 I have a funny feeling that a place like Firefly's is almost always full at night. As we dragged our full bodies back to the car, we were sad to read that - on the take-out menu I swiped - there were no Firefly's restaurants in our immediate area. I think Fall River could do with a place like this. Perhaps it would give the people here a chance to taste something other than chourico and cacoila. This was definitely a restaurant that we would drive all the way to Quincy for, and I'm so glad that their exciting commercials popped into my head at the last minute. 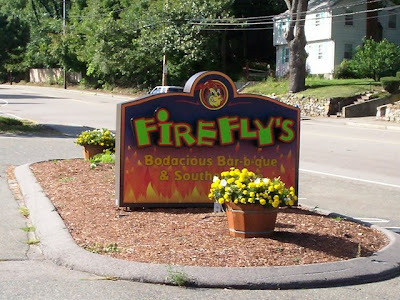 We are so thankful that Firefly's saved us from having to drive back to Fall River hungry. We might have killed ourselves ... or each other. 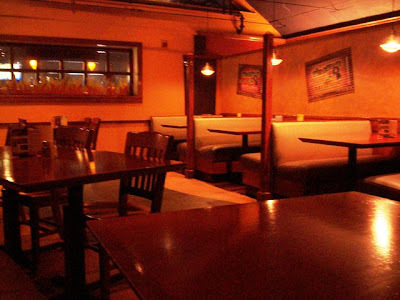 Firefly's in Quincy is open from 10:30 a.m. to 10 p.m. on Sunday, 4-10 p.m. Monday through Wednesday, 4-11 p.m. on Thursday and Friday, and 11:30 a.m. to 11 p.m. on Saturday. The bar stays open until 1 a.m. on Friday and Saturday.